This is a must do tour for someone visiting Vilnius, Lithuania for the first time. It was a long tour but we did enjoy our time and company from our tour guide, Inga. She is super amazing person and provided information and history of the sites we visited during our tour. Inga provided much needed information on the city tour, important sites to visit so we have some ideas on what sites to visit on next day on our own. Panerai visit was very informative yet we felt sad after learning the history and what happened at the site during WW2 and Soviet occupation. 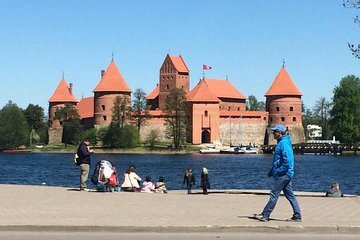 We did enjoy Trakai Castle tour, thanks to the good weather we had perfect time in the castle and Inga gave us enough time to explored the castle on our own. Since we were only 3 person plus Inga our guide, we felt that it was more of the private tour. We had lunch together at the famous kibine cafe in Trakai, thanks to the recommendation from Inga. It was one of the best pastries we have ever had!! We had a good time taking the tour and I would recommend this combined tour foreveryone visiting Vilnius for the first time. Long day but it was the more thorough tour we ever had. Thanks to Andreas!! We saw the most important monuments, churches, old cemeteries, town hall, a place with amazing nature view from the top of a hill, gates of dawn and much more and then off to trakai castle another spectacular place. MUST DO!